Acinonyx jubatus (Schreber, 1775) or cheetah is the absolute sprinter beyond all land animals. Being the fastest one on land it can speed up to 64 mph (Sharp in Journal of Zoology 1997) and then hold its speed for a maximum of 400 m. Recent research has shown that the cheetah does not reach its top speed very often but instead uses its power and ability to manoeuvre while hunting its prey (Wilson et al. in Nature 2013). Besides its slim body, long narrow legs and wide nose channel it is the claws that are especially adapted to its high speed. The claws are not completely retractable like in most other cats and work like spikes on running shoes in order to give more grip to the cat. It is also referenced in the scientific genus name Acinonyx coming from the Greek meaning “immobile –claw”. The pictures of the cheetahs in this post were taken in the Amboseli National Park in southern Kenya. 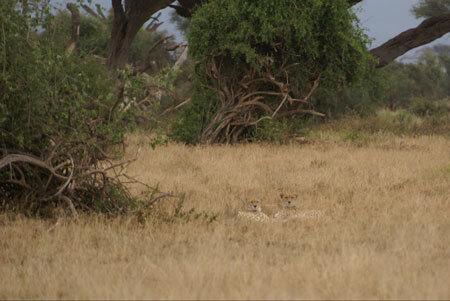 Two of them were lying in quite high grass next to some shrubs (see below) and were very well hidden by vegetation and their colour patterns. Adult females are solitary whereas adult male brothers live and hunt together. When a group of zebras passed close by they got a little bit more excited and rose. This was when the picture above was taken. The black tear shaped eye marks are very visible. The genetic variation within cheetahs is exceptionally low and has likely been caused by a bottle neck event around 10,000 years ago. Most of the cheetahs live in Africa. However, there is a small, highly endangered population of the Asian cheetah in Iran, Acinonyx jubatus ssp. venaticus (Griffith, 1821). 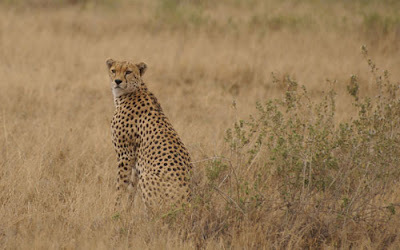 This subspecies is listed as critically endangered by the IUCN Red List and Acinonyx jubatus is recorded as vulnerable.